The NautilusU616 upright bike comes jam-packed with many features. It looks to be an aesthetically pleasing bike but does it also offer functionality. It comes with many different features like Bluetooth connectivity to connect to apps like myfitnesspal, in built fans to keep you cool, USB charging and much more. 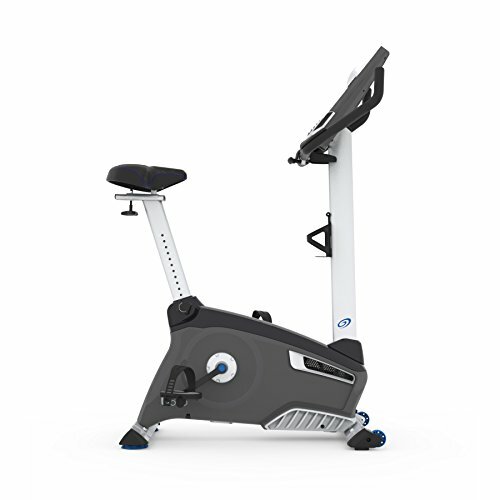 We will now continue to look at the NautilusU616 upright bike in detail. We will first study its dimensions, then we will look at its features and finally we will look at the construction of the bike. Once we have done that we will list some pros and cons and then proceed to the final score and our recommendations. The Nautilus U616 upright bike has dimensions amounting to 41 inches in length, 22 inches in width and 58 inches in height. On deliver and before assembly the NautilusU616 upright bike weighs a total of 78 pounds. After it has been assembled it weighs a total of 76 pounds so it is not very heavy but if that weight is also a problem for you then not to worry because it comes installed with transportation wheels. Now that we have taken a look at the basic dimensions of the product, let’s check out it features. 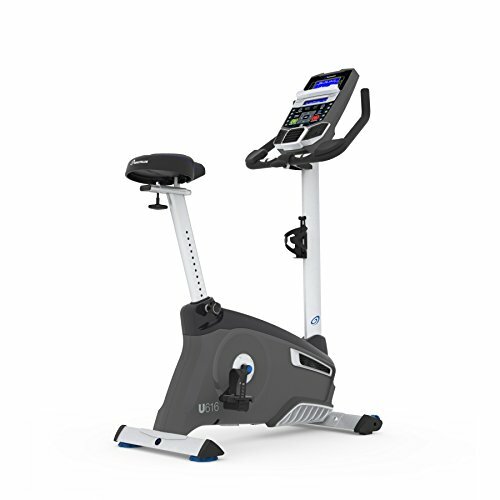 The Nautilus U616 upright bike has many different features that are not present in lower range bikes but you are not paying for a lower range bike. The NautilusU616 upright bike has a dual track LCD system and it allows you to cover one winder yet still track your workout. The Bluetooth LE Nautilus Connect goal tracking and data export keeps you aware of your progress and focused on your fitness goals. Using the USB charging port you can also connect your progress to myfitnesspal or other fitness apps. It has data export ability so you can export your data. The console comes loaded with 29 programs, 12 of these are profiles, and 9 of them are heart rate controlled, 4 custom programs, 2 fitness tests and 1 quick start option (which are what you will start with). The seat of the Nautilus U616 upright bike is adjustable and will help you get the perfect fit. The seat is padded and contoured for a comfy ride and its seat post system also allows for easy seat exchange. This machine has 25 levels of resistance, emphasis on the 25. That is a very big number; it allows for the maximum personalization that an indoor bike can give you. Also, these are eddy current resistance levels, not simply mechanical ones. The product also comes loaded with flywheels to help you get the momentum going if you want to crank up your workout on one of their 25 levels. The indoor bike has 3 levels on its fans from low to medium to high. 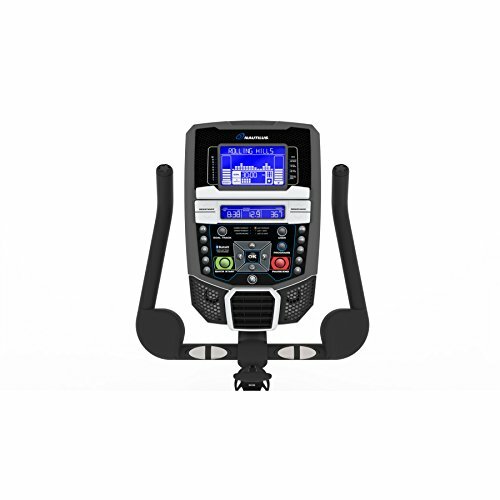 The handle bars on the Nautilus U616 upright bike are also adjustable and the bike has acoustic chambered speakers for good quality sounds. So you can put on your workout music and go crazy, just try not breaking the bike. Speaking of breaking the bike, let’s see how well constructed it is and what guarantees we have. 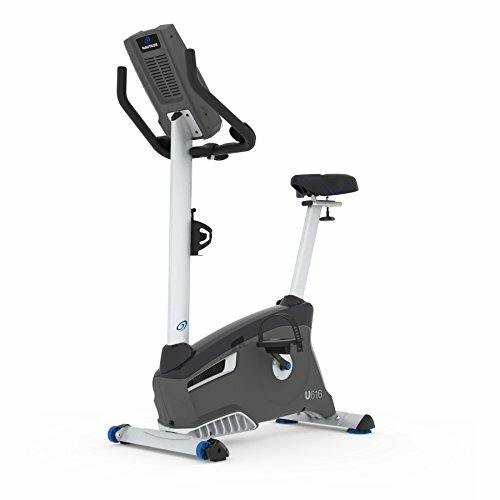 The Nautilus U616 upright bike has two integrated levelers for a solid workout performance. The transportation wheel allow for easy transport. It also has oversized crossbar tubing for added stability The Nautilus U616 upright bike comes with a 10 year warranty for the frame which is pretty good. Meaning the manufacturers are confident in their construction of this bike. There is a 2 year warranty for the mechanical parts, 1 year warranty for the electrical and the bike has a maximum user weight of 300 pounds. The Nautilus U616 upright bike looks like a solid buy even with a few complaints. The product may not be perfect but it is pretty close. We highly recommend buying the Nautilus U616 upright bike; we are sure you will enjoy this purchase and get the most out of it in your fitness journey. A stable, reliable bike that will be a good investment. Is compatible with bluetooth as well as provides extra interesting features with myfitnessapp.